My intention is that, through ‘You Are More Powerful Than You Think,’ I can help others free themselves from the pain of their humanity and become conscious of their innate divinity to live their soul purpose. Transformational healer, spiritual teacher, life coach and successful chiropractor Dr. Fred DiDomenico has released his inspirational, six-step guide to spiritual and emotional healing that leads readers to their innate divinity and, ultimately, helps them to discover and fulfill their soul purpose – the reason they are here in this life. In “You Are More Powerful Than You Think,” Dr. DiDomenico takes readers on a journey of self-awareness as guided by his H.E.A.L.E.D. system, which helps them realize they are truly, innately a spiritual being living a human experience with a soul purpose. He demonstrates to them how they can unconditionally love themselves and others, and frees them from their limiting beliefs, emotions and pains of their past. They are given the tools to easily forgive themselves and others, providing them freedom from their suffering into the peace of presence. With this peace of presences, they can hear the whispers of guidance to discover and fulfill their soul purpose to live a more joyful life. Throughout his book, Dr. DiDomenico taps into the knowledge and wisdom of many spiritual authors and leaders from around the world, twining his personal life stories with spiritual epiphanies from past pains and experiences to share with readers the life lessons and daily application of these principles. It was his incessent lifetime pursuit to know his true, innate power and spirit within that drove him through this discovery process. His challenges, pains and blessings through his life experiences helped him to hone his purpose and gave him the insight to live a more joyful, authentic and empowered life. Now he is sharing this divinely ordered system, H.E.A.L.E.D., so that readers can do the same. 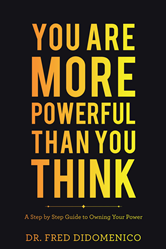 Dr. Fred DiDomenico currently resides in Newport Beach, Calif. To learn more, please visit http://www.youaremorepowerful.com and http://www.elitecoachingllc.com, connect with Dr. DiDomenico on Facebook and LinkedIn, and subscribe to his channel on YouTube.